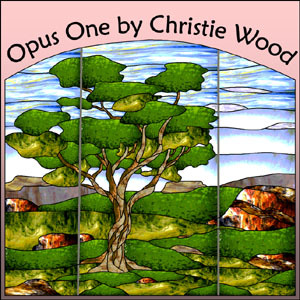 Opus One is a collection of traditional stained glass panels, non-traditional freeform wall sculptures, fireplace screens, suncatchers and mirrors spanning a wide range of styles: Victorian, art deco, Southwestern, religious, fantasy, landscapes, and animal portraiture. This collection features over 50 best-selling designs produced in Christie Wood's Art Glass Ensembles studio for a wide audience. Christie’s "Gibson Guitar" design from this collection was a first place winner in the 2004 Delphi Online Art Glass Festival competition!